Perfect for 4x promoters looking for a solid starting system, or BMX training facilities who want the look and real-deal-race-day-feel of the next Challenge hill, Pro Gate’s Crescent-4 is the perfect fit for your less-than-eight ambitions. After seeing our Crescent-8 in action at at the UCI World Challenge, and on Challenge hills around the world, 4X promoters and training facility managers asked us to make a four-rider configuration available. Always happy to oblige. 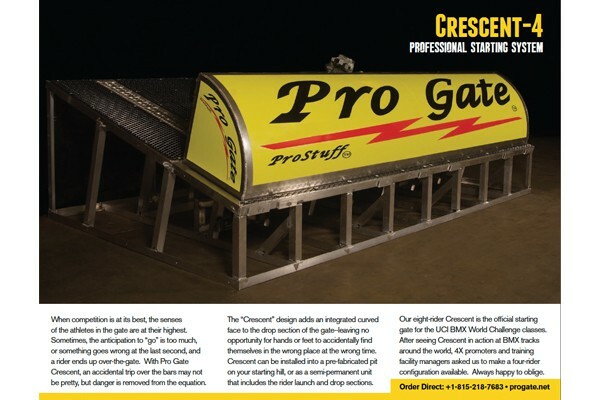 The Crescent-4 can also be fitted to a trailer, so promoters can take the gate to wherever the racing action takes them.